San Antonio is a great destination for almost any type of traveler. With tons of popular attractions and free things to do for visitors of all ages, you can ensure a vacation that is fun for everyone in your group! 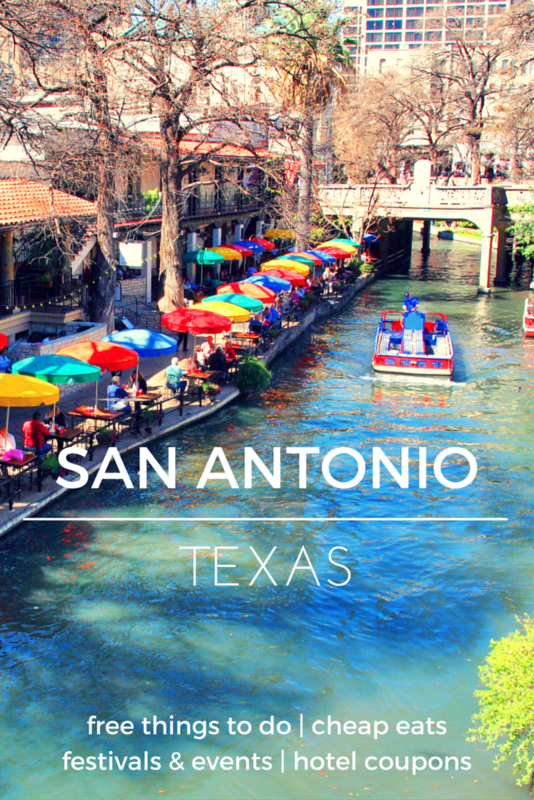 Look for more details to help plan your trip to San Antonio in our listings below! The Alamo is the most well-known and revered San Antonio attraction – and it’s free to visit! No matter how long you’re staying in San Antonio, The Alamo is a must-see. Enjoy the Mission Reach Linear Park, which spans eight miles along the San Antonio River. You’ll find biking and walking trails, picnic areas, and more. You won’t believe the beauty of the San Antonio Missions. Walk the park, take photos, soak up the history before you, and even catch a free guided tour! During the summer season (June – August), San Antonio offers more than 25 outdoor swimming pools where you can swim for free! If you’re looking to cool off, check out one of these public swimming pools. San Antonio is awesome for many reasons, and one of them is Downtown Tuesday! All city-operated lots, meters and garages are free every Friday night from 5 p.m. – 2 a.m.
Did you know it’s free to stroll the serene Japanese Tea Garden in San Antonio? Enjoy bridges, fountains, waterfalls and flowers as you walk the paths of this Japanese paradise. Plus, grab refreshments at the Jingu House Café. For a leisurely day in the Texas sun, visit Brackenridge Park, which features walking trails, sports facilities, picnic areas and more. Plus, within the park you’ll find the Japanese Tea Garden and the San Antonio Zoo. There’s nothing like a tour that ends with beer samples! Two breweries in San Antonio offer free tours: Branchline Brewing Co. and Ranger Creek Brewing & Distilling. Slab Cinema hosts free outdoor movie screenings about once a month in San Antonio. If you’re looking for an inexpensive but unique date night, this is for you!